Amara’s school has a music program for 3rd graders now. They all started by learning to play the recorder this year. Next year they get to pick an instrument! This was their first concert and it was nothing short of amazing. 150+ 3rd graders on stage playing together and they sounded very good! They had obviously practiced hard and memorizing the notes to six songs could not have been easy. The students were all very excited about performing on stage. 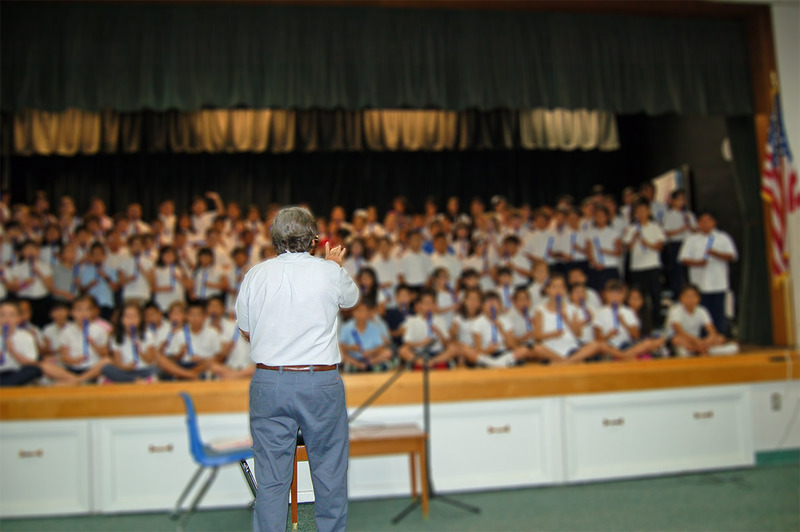 I must apologize, I don’t have permission to post the photos of all of the students which is why so much of the picture is blurred out but I wanted you to see what 150 3rd graders look like on a small stage in their cute white shirts and dark pants! It was another fun day to be one of Amara’s Grandmas and she was lucky to have both of her Grandmas sitting in the front row along with Mommy. However, Daddy wasn’t there. He had tried to get the time off from work but just couldn’t and she had been devastated when he told her the night before. There were even tears until she came up with a plan. Mommy could just do a Google Hangout with Daddy and he could watch the whole thing over her phone! While this was a great idea, Jenna was panicked because the connectivity in the Media Center is always terrible. What if it wouldn’t work? We had gotten there a little early so she could try it out. As Mrs. G was bringing in one of the classes, she told Jenna she would need to turn off her phone. When Jenna explained she was going to video chat Justin so he could watch it live, she mumbled something about going to the back to throw up. While I had told Amara that I was videotaping everything for Daddy and Grandpa, she really wanted Daddy to be in the audience. There were some real moments of panic in the beginning and one very unhappy face on stage until the Interwebs decided to cooperate. Jenna was able to share almost the entire concert with Daddy. The moment Amara knew he was watching she started beaming. But the best part was looking over and seeing Justin on Jenna’s phone with his head bopping to the music. They are such involved parents! This memory was posted in Special Occasions and tagged Amara, concert, daddy, Google on May 17, 2013 by Grandma Kc. I love school programs. 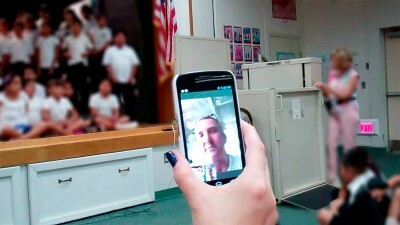 What a great idea to video chat with someone who can’t be there. it sounds like Amara is going to a wonderful school! Music is such a wonderful addition to a child’s life, and learning to play an instrument is such a special opportunity. What a special girl to have such love and involvement from parents and grandparents! Thanks for sharing this wonderful event. Love the post. Music is such a wonderful part of a person’s life. My grandkids play acoustic and electric guitar and the piano and don’t go anywhere in the car without their own music to listen to. Fans of 1Direction and the Beetles don’t always mix. It is amazing what technology can do and you are very literate with the new options. I love the teacher’s comment and I could just visualize it. Congratulate Amara on such a wonderful accomplishment. Music – yet another area for Amara to experience and become proficient at! I love how this school involves all the children. My daughters were given the option to select an instrument at the end of 4th grade. Band began in 5th grade. None of the 3 stuck it out with their flutes or clarinets but I’m glad they had the chance to try it out. The live-taping-for-daddy is one of your cutest stories ever! Mrs. G better get used to Amara’s fan base! I am just so glad that Amara is becoming so well rounded! Not only is she a really good student she loves art, Tai Kwon Do, cooking, sewing, gardening — and not just one thing. Her parents are doing a great job and I’m so glad we are part of it! Because I am lucky enough to be Amara’s great aunt, my beautiful sister, Kc shared the videos with me. The kids really did a fantastic job and they all looked like they were having such a great time! I’m so happy that Amara is a student at her school – and I wear my T shirt with pride every chance I get! That is so cool! You guys have the Google hangout thing down MUCH better than I do, as you recently read. Great parents! And hooray for Google. Our students do recorders as well. Six songs and so many of them. That is impressive. Technology can provide us with most amazing things right along with the fiercest headaches when we know what it can do and it won’t work. Ugh. Glad everything lined up. What a great use of Google Hangouts!